With the Hyper Phase stereo phaser, you are not limited to only one mode of operation like you find in most pedals. 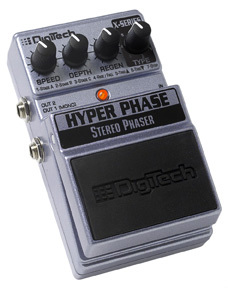 DigiTech gives you 7 different modes to choose from using the mode control "Type" knob. You can have your choice between a 4, 8, or 12 stage phaser, constant rising or constant falling phaser, triggered phasers, or step phasers. 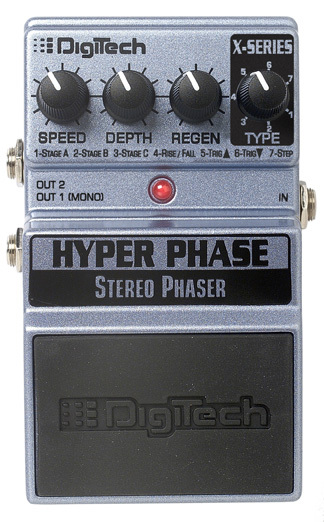 You have full control of the phaser by using the speed, depth, and regeneration knobs and can run the pedal in mono or stereo. Why settle for a "one trick pony" phaser pedal when you can have one that gives you 7 pedals in one rugged sturdy metal chassis?! No one gives you the power to create like DigiTech does!